Wesley Ryan used to be known around San Antonio for his beloved 1993 Ford Mustang, which he called Christine. He named the iconic car after the 1983 move of the same name, and his daughter says the hot-rod was the way to his heart. About 12 years ago, Wesley had to part with Christine. His wife, Laura, was diagnosed with ovarian cancer and needed surgery. "Medical bills were piling up," Wesley and Laura's daughter, Jeni, told CBS News. "My dad without hesitation posted his car for sale and within two days, someone came and got it and that tore my dad into pieces." "When I was born, that was the vehicle he took me home in. So, that car had a lot of sentimental value," Jeni said. She and her brother, Jake, were just kids at the time, but they knew how important the Mustang was to their dad. Now that they're adults, they can truly understand the sacrifices he made for their family, and they wanted to find some small way to make it up to him. They decided to find the original Christine and buy it back for their devoted father. "Me and my brother both agree buying this vehicle is nowhere near what my dad has done for this family," Jeni said. She described her dad's "insane work ethic" and all the things he did for them as children. "I played sports, so has my brother, and if we needed cleats... my dad was the first one to spend the last penny to make sure we were fully equipped with stuff," she said. That's why the siblings went on a mission to track down and re-purchase Christine for him. At first, it didn't work out. "My brother found the vehicle on Craigslist about two years ago, but we couldn't agree on the price ... so we politely declined it," Jeni said. Then, about two weeks ago, Jake decided to look for Christine again — and this time he was in luck. "So my brother calls me, tells me, 'Hey, I found Christine online,'" Jeni said. Without hesitation, Jeni, her boyfriend Julian, and her brother contacted the woman selling their dad's old car. "That same day we drove up to Kyle, Texas, to go pick her up," Jeni said. The trio then orchestrated a plan to surprise Wesley with the car that night. Their mom, who is now 13 years cancer-free, helped coordinate. They told their dad to meet them at the local Kohl's parking lot around 9:25 p.m. and he reluctantly showed up. "It was pretty crazy, a lot of props to my brother that nigh," Jeni said of the grand surprise. "The whole time [my dad] thought something was wrong ... He had no idea what was going on." When Wesley arrived, his kids blindfolded him and sat him on the curb. Then, they rolled Christine in on a flatbed truck. They had their dad stand up in front of the Ford Mustang and took the blindfold off of him. He was immediately overcome with emotion. Jeni and Jake had fulfilled their dad's wildest dreams. 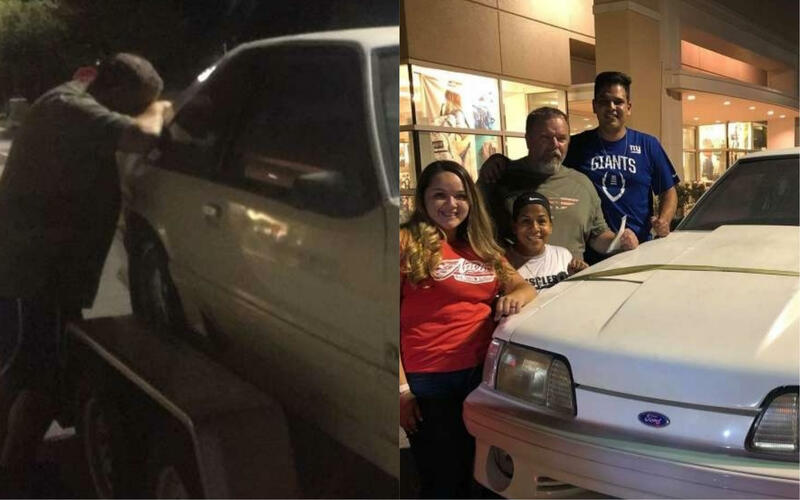 It was the exact car he owned nearly 12 years go — his kids had matched the VIN number to make sure it was the real Christine. The touching video shows Wesley crying then giving each of his kids and Julian a big hug. He walks over to Christine and leans his head on the car as he sheds more tears of joy. The video went viral after Jake posted it on Facebook. "We never imagined to for this to be as viral as it is. My dad is loved by many, so I figured locally it would hit a lot of people, but not once did I think it would be hitting worldwide," Jeni said. "To me, it's not about being viral ... it was just something small that we could do for him." "That's not his world, but it's one of the pieces to his heart. You just can't replace it with any other vehicle," she said. "He's not materialistic — he just wants his family taken care of. And at the end of the day, this all started because my mom was diagnosed with cancer and my dad being the man that he is, he decided to sell his vehicle in a heartbeat." Jeni says she still cries when she watches the video of the surprise. "He never expected anything back from us. All my dad wanted us to be is successful, and that's all he ever asked from us. He never asked for his vehicle back," she said. "Literally, words cannot explain that video because that video explains absolutely everything."